No. 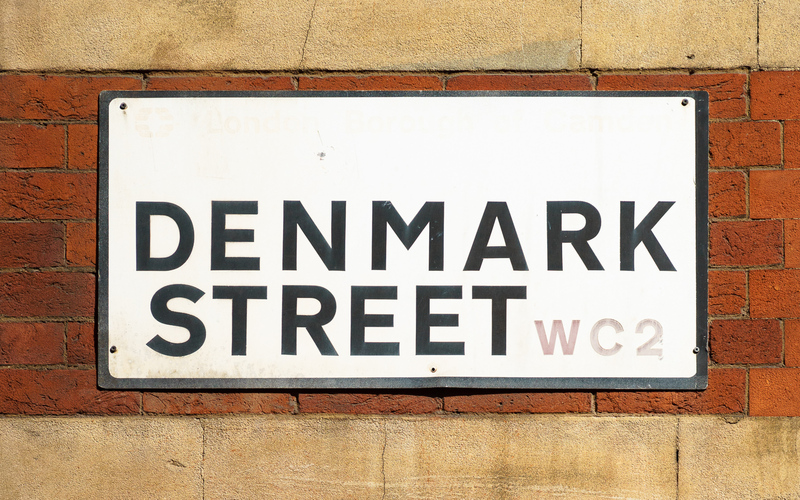 20 is one of eight listed buildings on Denmark Street. Originally a terraced house, it formed part of the estate development by Samuel Fortrey and Jacques Wiseman when Denmark Street was laid out in 1686-89. The rear of the shop runs into 16 Denmark Place, a 19th century warehouse. In the 1960s, No. 20 was the offices of publishers Mills Music, where a young Reg Dwight worked in the post room. Dwight went on to become better known by the name Elton John. Mills Music also earned an ignominious footnote in Rock and Roll history as being the company that turned down Paul Simon when he presented Homeward Bound and The Sound of Silence to them here when he lived in London in 1965-66. Following a spell as Rod Argent’s sheet music shop (now next door at No. 19) in 2006 Wunjo Guitars moved into No. 20 from its former premises round the corner on St Giles High Street. Owner Brian Rowe tells me that he chose the orange and brown colour scheme to be as loud as possible to attract attention and and to stand out from the other shops on Denmark Street. The formula seems to have worked well enough to be extended to two other shops: Wunjo Bass at No. 22 and Wunjo Keys at No. 23.